Reacts with amphibian, cattle, chicken, gerbil, guinea pig, human, mouse, porcine and rat alpha-Tubulin. Liquid. PBS (pH 7.4), 1.5% BSA, 5mM sodium azide. 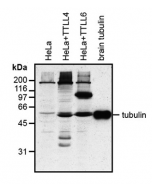 Tubulin is a major protein which consists of micro coronary structure which exists in almost every cell. 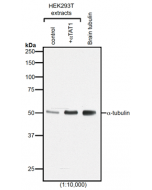 The product recognize 426-450nm epitope of amino acid alpha tubulin. 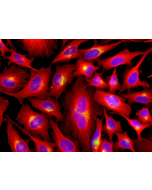 You can make fluorescent images of any waves that you choose for the secondary antibodies with the mark of various fluorescent waves. 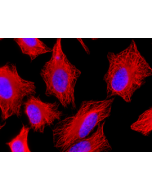 For characteristic mark of Tubulin, you can use Goat anti-Mouse IgG which is a combination of various flouriscent materials Flamma® series or horseradish peroxidase (HRP). 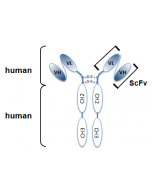 Dilution factor Flow Cytometry (Flow) 3-5 µg/10^6 cells, Immunocytochemistry (ICC), Assay Dependent Immunofluorescence (IF) 2 µg/mL, Immunohistochemistry (Paraffin) (IHC (P)) 1:400, Immunomicroscopy (IM), Assay Dependent Immunoprecipitation (IP) 2 ug/mg, Western Blot (WB) 1 µg/ml.